While the NB-52 was carrying X-15-1 as expensive wing cargo, engineers were testing the XLR11s at the Rocket Engine Test Facility using X-15-2. Despite the successful 22 May test, things were not going particularly well. Perhaps the engines had been out of service for too long between programs, or maybe too much knowledge had been lost during the coming and goings of the various engineers and technicians over the years, but the initial runs were hardly trouble-free. Various valves and regulators in the propellant system also proved to be surprisingly troublesome. Moreover, sometimes things just went to hell. 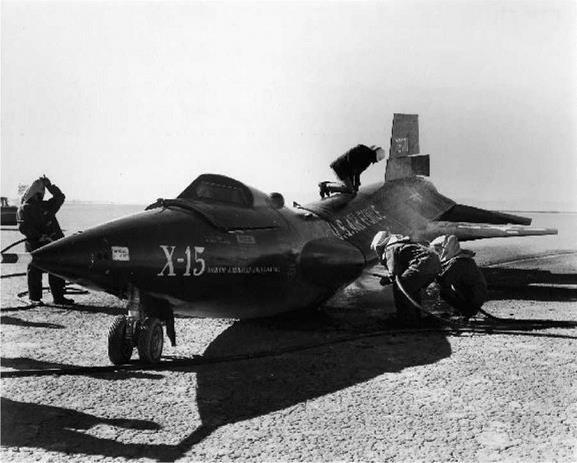 After one engine run, the ground crew began purging the hydrogen-peroxide lines of all residual liquid by connecting a hose from a ground nitrogen supply to a fitting on X-15-2. On this day, it was a new hose. Despite the careful procedures and great caution used, the hose had a slight residue of oil. When the technician applied gas pressure to the hose, the film of oil ran into the hydrogen-peroxide lines. The only thing truly compatible with peroxide is more peroxide, not oil. The result was an immediate explosion and fire that raced through the X-15 engine compartment. As always, the Edwards fire crew was standing by and quickly extinguished the fire, but not before gutting the engine bay. 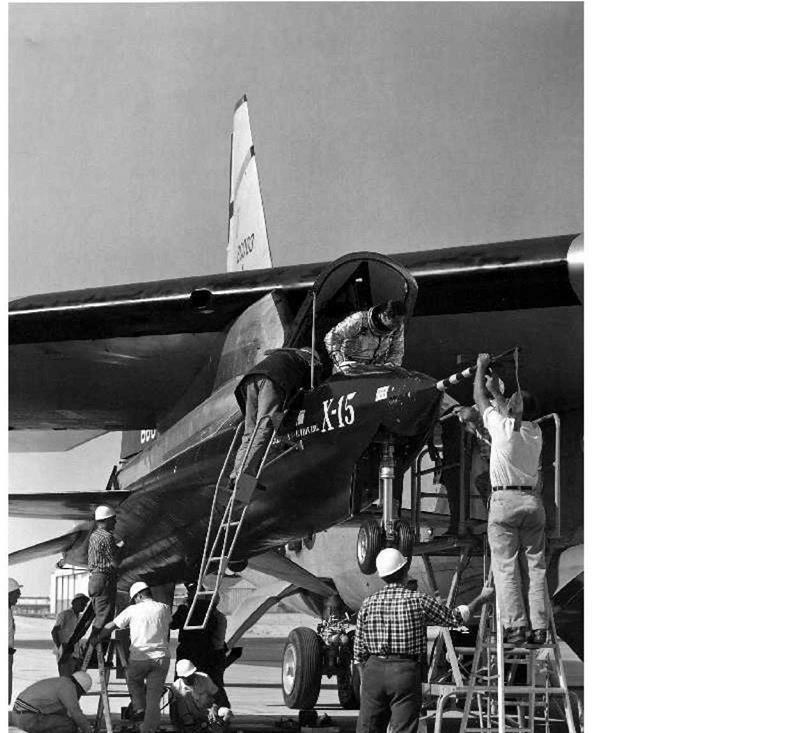 One X-15 crewman was badly burned; if he had been standing two feet closer, he likely would have been killed. It took weeks to repair the airplane. Forty-six days after the first glide flight, and after the damage from the explosion was repaired, the Nb-52A took X-15-2 for a captive-carry flight with full propellant tanks on 24 July 1959. One of the purposes of this flight was to evaluate the liquid-oxygen top-off system between the NB-52 and X-15. It proved to be erratic. Another test was to measure the time it took to jettison the propellants at altitude. While still safely attached to the wing of the NB-52, Crossfield jettisoned the hydrogen peroxide, which took 140 seconds. He then jettisoned the liquid oxygen and alcohol simultaneously, which took 110 seconds. The times matched predictions. The APUs and pressure suit performed flawlessly. Despite the failure of the top-off system, researchers considered the flight a success. The original contract had specified that North American would turn the first airplane over to the government in August 1959. For a while it looked like the company might deliver the first X-15 on schedule, but it was not to be. During August and early September, engineers canceled several attempts to make the first powered flight before the aircraft left the ground, due to leaks in the APU propellant system and hydraulic problems. There were also several failures of propellant tank pressure regulators, and on at least one occasion, liquid oxygen streamed out of the safety vent while the NB-52 carried the X-15. No flight occurred on that day. Charlie Feltz, Bud Benner, and John Gibb, along with a variety of other North American engineers and technicians, worked to eliminate these problems, all of which were irritating but not critical-other than to the morale. A typical launch attempt would start the night before, and the crews would work all night preparing the X-15 and fueling it. About 8 a. m., Scott Crossfield would be in his flight gear and, after walking around the operation, get into the cockpit and start his checkout. Scott would stay in the ready condition as the countdown continued. This, unfortunately, might be as late as 3 or 4 in the afternoon before the B-52 would be allowed to take off. By the time it had reached launch altitude and attempted to hold for the required length of time with all systems in operation, sometime during this period a regulator would fail, a valve would fail, or the bearings on one or both APUs would go out. Then back to Edwards. When Scott returned, we would be scheduled to go to a press conference and meet many tired, and by that time somewhat edgy, reporters that always wanted answers that were just not available. These were not happy meetings for any of the participants. Shortly after about the fourth such encounter, I was gathered up by General John McCoy of Wright Field and taken over to Mr. [James Howard ‘Dutch’] Kindelberger’s office, the then chairman of the board. The general explained that the country was in a bad spot with the Sputnik success and that our false starts were not very much of a positive boost to the national position. In short, "when were we going to launch that X-15?" This one time in my life all eyes were on me. Not the most desirable position. The answer I gave was to go over the conditions that we and the NASA had set up for a launch. Also, I gave my support to this approach and pointed out that we were attempting to put a new type of flying machine in the air without the loss of either millions of dollars worth of equipment or the pilot. However, if they wanted to, I would take them to the task force that set up the launch ground rules and they could either convince them of a different approach or overrule them, if possible. The whole meeting ended up with the Air Force’s plea for increased effort on out part and hope for early success. Fortunately for all concerned, the next attempt turned out to be a winner. At last, Scott Crossfield made the first powered flight using X-15-2 on 17 September 1959. The NB-52A released the research airplane at 0808 in the morning while flying at Mach 0.80 and 37,600 feet. X-15-2 reached Mach 2.11 and 52,341 feet during 224.3 seconds of powered flight using the two XLR11 engines. Crossfield surprised everybody, including most probably himself, by performing another aileron roll, this time all the way around. As Crossfield remembers, "Storms was tickled." On a more serious note, he observed, "With the rolling tail one would expect very clean ‘aileron’ rolls without the classical adverse yaw from ailerons, and that is the way it rolled.